Measuring Instructions and an Order Form. 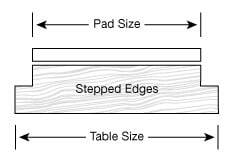 Pads are designed to rest on the flat portion of the top only, therefore if your table has square edges, measure to the edge itself. 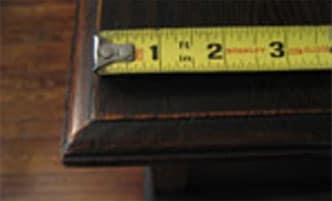 If however your table has a rounded or beveled edge, only measure to the point where the flat portion of the top ends, as shown in these pictures. 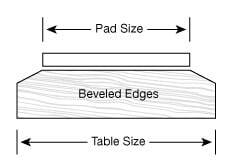 On tables with shaped top edges, the pad size is less than the overall table size because any slope, bevel, round portion etc. is not included when measuring. 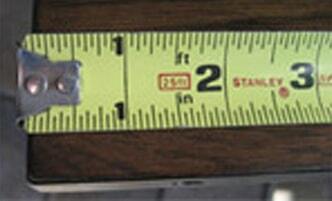 Need Help Using a tape Measure? 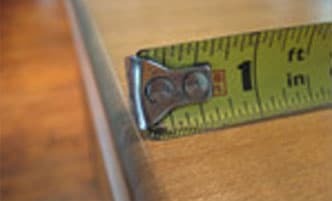 Measure the width (shorter measurement) of the main table top to the nearest 1/16”. Measure the length WITHOUT the leaves installed. 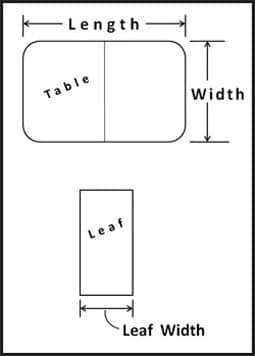 Measure the width of the leaves. 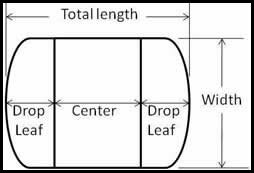 What we refer to as the leaf width is the measurement that adds length to the table when it’s inserted. 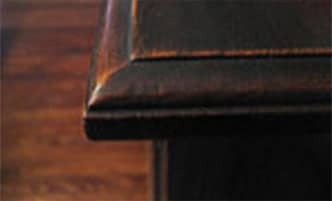 If your table is square or rectangular with squared corners, your measurements are all that are needed to place an order. 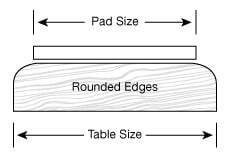 If your table is shaped, see below for patterning instructions. Measure the width and length of the flat portion of the top as per the above guidelines. 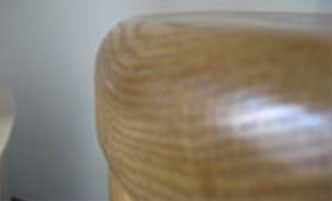 If your buffet is shaped, you will need a pattern in addition to your measurements. See instructions below. Raise your drop leaves (and remove any extra individual extension leaves if you have any). Measure the overall width and length (flat portion only). Measure the length of the main top and drop leaves individually (this should equal your overall length). Measure the width (shorter measurement) of the leaves. Make a pattern of any sections that are not perfectly square or rectangular. a pattern. 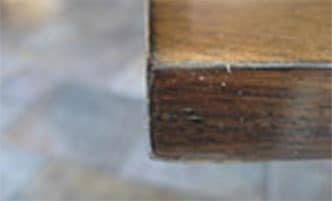 Table make and model numbers usually appear underneath the table top or sometimes on a sales receipt. 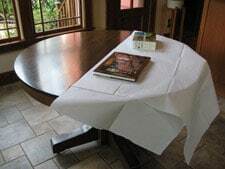 If your table is round, or has square corners or cut-corners, you don’t need to make a pattern. 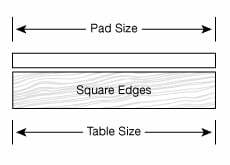 In other words, you only need to make a pattern if your table specifications are not in our database, and it’s not round, square cornered or cut-cornered. 1. Remove any extension leaves from the table. 2. Lay pattern paper flat on the top surface. 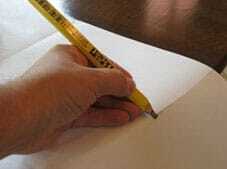 If your table has two main halves and a center seam, line up the edge of the paper with the center split. If you have a one piece top, make a pattern of the entire top, rather than one half. 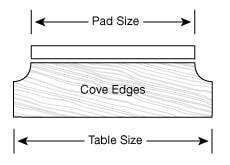 If you are patterning a buffet, align the edge of the paper with the back edge of the top. 4. Place two heavy books on the paper to keep it from moving. 5. Use the edge of a pencil or crayon to trace the flat portion of the top. Do not include any rounded or beveled edges. 6. 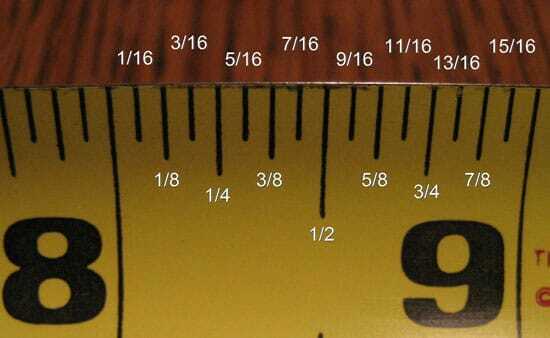 Double-check that your width and length measurements are consistent with the pattern. 7. Do not cut the pattern paper for any reason.